Start with all of your hair down. It can be wet or dry and you can do this on any hair texture. Tease the crown a little so it doesn’t get completely flat up top! You always want to give the top at least a little texture when doing a messy braid. Make a regular low ponytail using a thin clear elastic. Gently pull the clear elastic down about an inch to an inch and a half. Split the hair in two sections just above the clear elastic. Loop the whole ponytail up and around and through the hole. Fishtail the hair under the clear elastic. 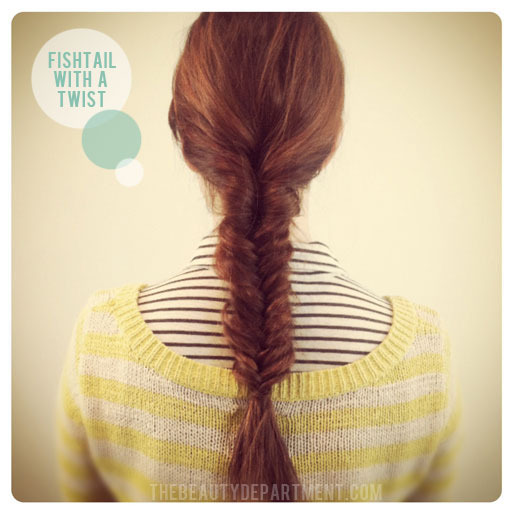 If you don’t know how to fishtail braid yet, watch THIS! Gently pull the braid apart to give it some soft, messy texture. Carefully cut out the top clear elastic, but leave the bottom one. Wrap a little hair around the bottom clear elastic to hide it. Use a small bobby pin on the back side to secure. VOILA! A new summer ‘do! If you have a hard time doing the back, get a friend to help. Sometimes it can be difficult to get a centered braid by yourself!